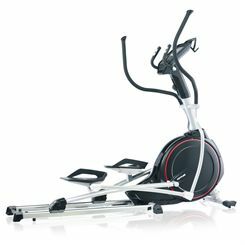 Take to the Viavito Sina elliptical cross trainer for effective, low-impact cardiovascular workouts with fluid motion thanks to the 9kg (19.8lbs) flywheel. The stride length measures 38cm (15”) and the footplates are large to ensure a comfortable exercise position. Raise the resistance using the 32 computer controlled magnetic levels and test yourself on the 20 workout programmes that include 12 pre-set, 4 heart rate control, watt, body fat and more. Your feedback is displayed on the dual colour backlit LCD screen, and the machine boasts a kilometre/mile switch and 4 user profiles that can be customised to get more precise feedback. There are both fixed and moving handlebars with hand pulse sensors on the fixed ones for measuring heart rate, which can also be done via the wireless receiver and a chest strap (optional). 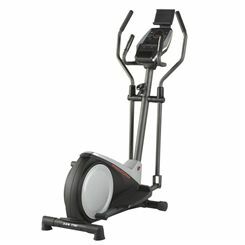 Get a full-body cardio workout and hit your fitness goals with the NordicTrack Commercial 12.9 elliptical cross trainer. 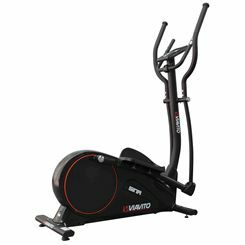 The 15kg (22lbs) effective inertia flywheel delivers really smooth elliptical motion for a comfortable ride and workout experience. Use the 26 digital levels of SMR Silent™ Magnetic Resistance to up the intensity and your heart rate so you burn more calories and reach your fitness target quicker. The power ramp has an incline of 0-20% which lets you vary sessions and work more of your muscles to a greater extent. The stride length is power-adjustable – 18”-20” (46cm-51cm) – and there’s a huge range of 37 programs and the trainer is iFit compatible (subscription not included) which gives you loads of great workout features. 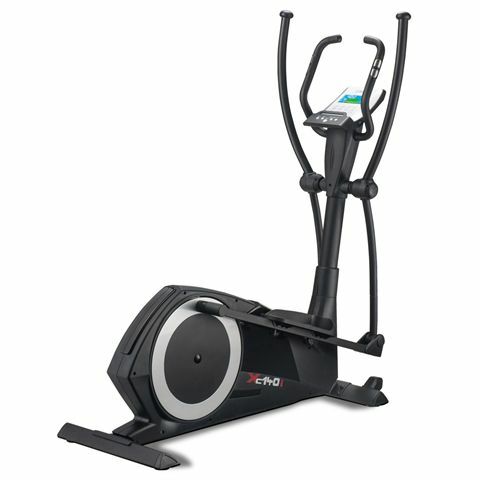 The DKN XC-140i elliptical cross trainer is a sturdy and feature-packed piece of fitness equipment with a 14kg (31lbs) flywheel ensuring fluid motion. 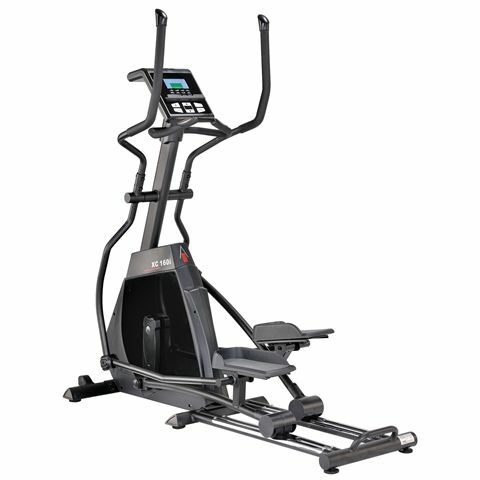 With a 16" (40.6cm) stride length and 32 levels of magnetic computer controlled resistance, the machine provides great performance and lets you vary the intensity of each workout to achieve your goals faster. There are 4 user profiles storing age, gender, height and weight, as well as a choice of 15 programmes enabling you to challenge both lower and upper body. The XC-140i is fitted with a clear, 2-colour backlit LCD display offering feedback on time, speed, distance, calories, watts and pulse and to measure heart rate you can either use hand pulse sensors or a Bluetooth Smart wireless receiver with an optional chest strap. To explore iconic routes around the world and help you maximize workout experience, the cross trainer is compatible with Vescape and Kinomap apps (free download from iTunes or Google Play Store). Work both your upper and lower body on this practical space-saving cross trainer which folds up after training to take up less room in your home when not being used. 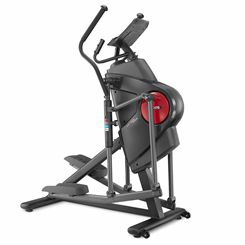 This rear-drive elliptical with an 18" (45.7cm) stride delivers smooth and comfortable motion, and you can increase the intensity and challenge yourself using 16 levels of Silent Magnetic Resistance and 19 workout programmes. Enjoy your exercising more thanks to a number of features such as music speakers, a cooling fan and iFit Coach BLE technology compatibility. 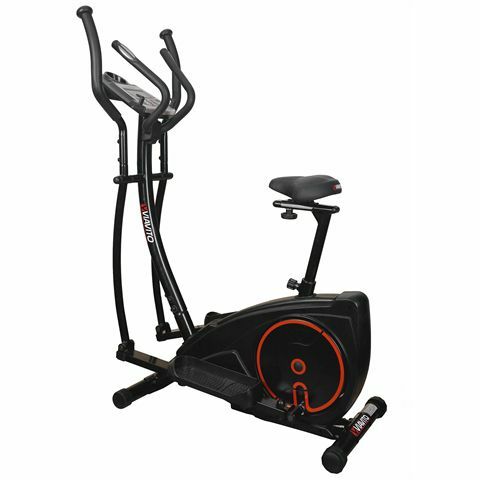 This 2 in 1 elliptical trainer and exercise bike brings you the best of two workout machines with the cost and space of one. 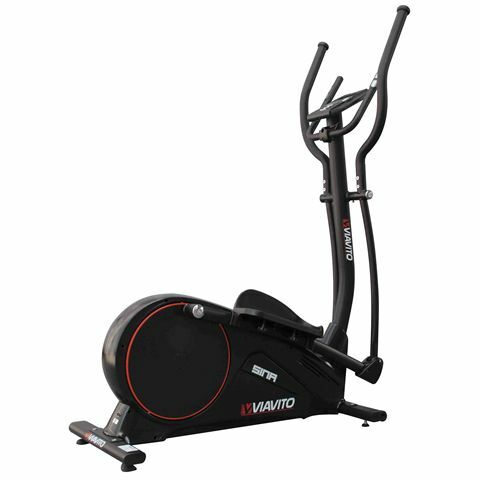 The combination of a cross trainer and an indoor cycle ensures comfortable and effective cardiovascular fitness sessions, and this trainer delivers smooth motion with 32 levels of computer controlled magnetic resistance and 19 programmes to get you into shape. Other top features include an LCD screen, 4 user profiles, a 5kg (11lbs) flywheel, hand pulse sensors and a wireless HR receiver, and an adjustable seat. 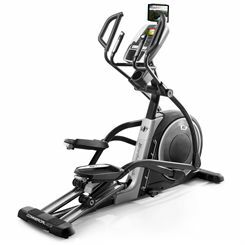 Accelerate weight loss and work the whole body using the ProForm 325 CSE elliptical cross trainer with a 9kg (19.8lbs) Effective Inertia flywheel ensuring a smooth and steady pedal stroke. This reliable piece of fitness equipment has a stride length of 36cm (14”) to let you exercise each muscle group completely and there are 20 levels of Silent Magnetic Resistance (SMR™) and 11 Quick Resistance keys on the console for easy selections. Fitted with a large, clear round Watts LED display with Endurance, Tempo and Peak zones, the cross trainer provides instant feedback on crucial workout data and it allows for measuring heart rate with EKG hand pulse sensors or Bluetooth Smart wireless receiver with an optional chest strap. The 325 CSE enables you to choose from 20 challenging pre-set workout apps, use a manual programme to change the resistance of pedals with a touch of a button and to create custom manual workouts with alternating high and low intensity intervals. Maximize your workout experience thanks to iFit Coach BLE functionality and keep your tablet secure with an integrated adjustable tablet holder. 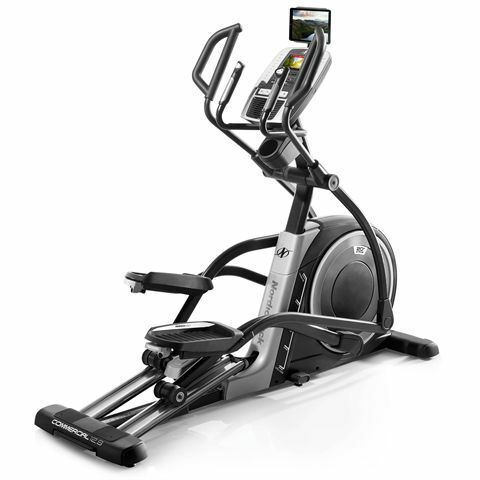 For the most comfortable workout position, the elliptical offers oversized pedals and Soft Touch upper-body workout arms. 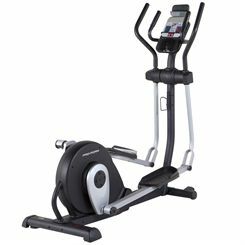 The high-quality DKN XC-160i elliptical cross trainer has a heavy 20kg (44lbs) flywheel and a large 50.8cm (20’’) stride length which deliver excellent motion and performance for a top workout experience. 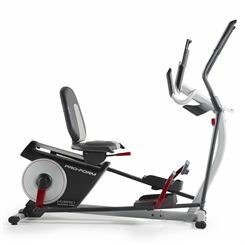 The machine is made to work and last like a semi-commercial cross trainer and boasts 32 levels of magnetic resistance and 12 pre-set workout programmes to get you moving and exercising at the intensity you want. The elliptical is compatible with the Android and IOS Kinomap and Vescape apps, and lets you create 4 user profiles to store info and get user-specific feedback. The multi-functional colour LCD display shows time, RPM, distance, calorie burn, watts and heart rate readouts, and you can measure heart rate using the pulse grip sensors or via the wireless receiver by wearing a compatible chest strap (not included). Ever wondered if you’re working out effectively or just huffing, puffing and wasting your time when exercising? 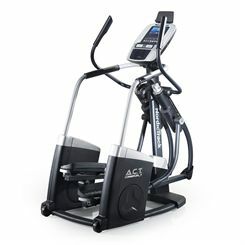 The Proform 7.0 Elliptical Cross Trainer takes all the guesswork out of it with its unique power output and target indicator system. Your target power output and actual real-time power output are clearly displayed on the bright LED display so there’s no mistaking if you’re working hard enough to achieve your fitness goals. If you haven’t reached the target indicator on the dial then increase the pace or the difficulty until you do. Keep your actual power output matched to the target until you’ve finished your workout and you’ll know for certain that you’ve achieved what you set out to do. Never experience an ineffective workout again! An elliptical trainer, also known as a ‘cross trainer’ is a cardio vascular machine designed to replicate the upper and lower body motions of walking, jogging and running while keeping the pressure off your joints. A more recent invention, the cross trainer appeared a little over 20 years ago but has since become a staple in gyms across the world. It’s also becoming ever more popular in homes, so let’s look at why, what it can do for you and what to consider when buying one. 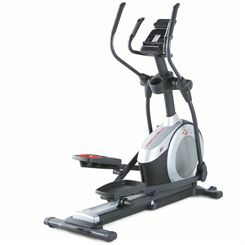 Why should I buy a cross trainer? For anyone wanting to get fit an elliptical cross trainer is a great option. Since exercising on one involves both your arms and legs, a cross trainer is a big calorie burner – up to 12 calories a minute if you’re really exerting yourself – suiting it to weight loss programs. Plus, as well as being a big calorie burner a cross trainer can improve flexibility and tone the whole body. It builds strength and endurance in a greater number of muscles than an exercise bike or a treadmill, so you can really get fit and perform a quality cardiovascular home workout on a cross trainer. Cross trainers keep the impact low and the movement is guided by the handles and footplates, minimising injury from impact or poor technique. They are very safe to use because they keep the stress and impacts on your joints to a minimum, so people recovering from injuries and those who are overweight or just starting out on an exercise program will find cross trainers to be a useful piece of fitness equipment. What’s more, since you don’t take your feet off the pedals and impact them back down, ellipticals tend to be fairly quiet to use, which is always appreciated in the home! When using a cross trainer you can target train by varying the exertion between the upper and lower body: you could direct the power to the legs to tone the thighs, pull harder on the handles to strengthen the back and shoulders or add a twisting motion to slim the waist area. So the cross trainer is a versatile, effective, low-impact, calorie-burning fitness machine that almost anyone can use. Now let’s explore a few other aspects of cross trainers. How do I know which cross trainer is for me? Finding the right cross trainer for you boils down to a few main things. Obviously if you have a budget then that will narrow down your search, and we will look at prices later on. But before deciding on a budget you should ask yourself a few other questions. How often do you plan on using it? And what are your aims? If you plan on gentle usage a couple of times a week or intense, regular training, this will have a big bearing on the machines you should be considering. A more basic machine will probably suit the first scenario, but someone training for events or who wants to do intense interval training will need a sturdier machine with a better spec. How much space do you have? The average cross trainer length is about 1.5m but some can be more than 2m long! A few models will have a folding system to help save space at home, but it’s not as common as on treadmills for example. Who will be using the elliptical? Keep in mind the height of the machine’s potential users. Most stride lengths fall between 12-20” (30-50cm). In general, the taller you are and the longer your legs, the longer stride length you’ll need. Having a stride length that’s too short will make exercising on the trainer uncomfortable, and if it’s too long you might put unnecessary strain on your muscles. You can find ellipticals with a variable stride length. If there will be multiple users, you may want a trainer with user profiles so each person can store their data, and more programs or interactive features. Other things to look for include the flywheel weight, the Q factor, levels of resistance and heart rate monitoring. When you exercise on a cross trainer your motion turns the flywheel, and the heavier the flywheel the smoother the motion. Ideally you want your flywheel to be over 7kg. The Q factor means the distance between the two foot pedals, with the closer the pedals are the more comfortable the cross training motion. Resistance is usually magnetic and controlled by buttons on the console. Low-intensity users will find machines with fewer levels fine, but those looking to train harder will need more choice, especially to keep the challenge up as you get fitter. Heart rate measurement on a cross trainer can be achieved in two ways: via hand sensors or a chest belt if the machine has a wireless heart rate receiver. The chest belt method is more comfortable and accurate and lets you perform heart rate controlled workouts so you train in the right HR zone. What’s the difference between a front drive elliptical and a rear drive elliptical? 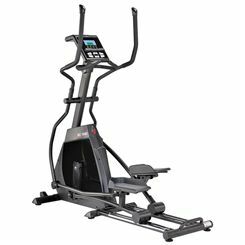 The shape and design is the most obvious difference – front drive cross trainers have the flywheel located at the front of the machine, rear drive ellipticals at the rear. The main difference is that rear wheel drive machines normally have a steeper leg action which somewhat replicates the motion on a stepper. Front drive motion is closer to that of jogging. It’s important to note that neither is better than the other, you may just prefer one style over the other. 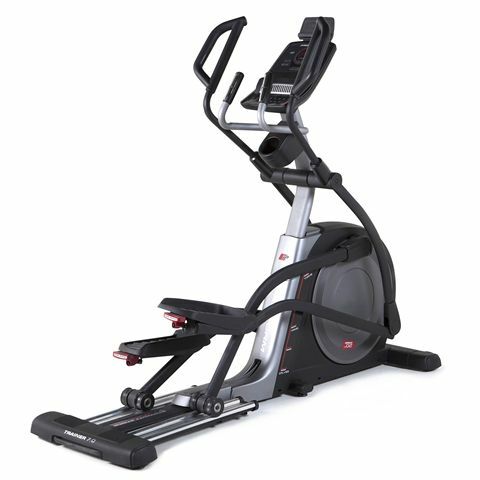 Front drive ellipticals tend to start off at a slightly higher price than rear drive. So how much do elliptical cross trainers cost? You could spend under £200 on one, or over £10,000! 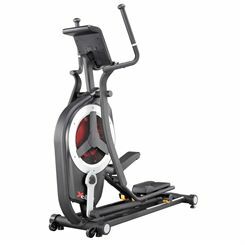 Most people looking for a home cross trainer will spend between £300 and £1,500. More than this and you’re into the gym-quality commercial models. Yes, generally speaking the more expensive the machine the better the specs, performance and comfort, but spending more doesn’t guarantee you’ll find the right machine for you. Make sure you know what you’re looking for and you’ll see at what sort of price bracket those features are available. How will my cross trainer be delivered? Your machine will be delivered free of charge to most UK mainland postcodes on a fast and efficient service. We use a number of methods to deliver cross trainers including specialist 2-man teams for heavier and bulky items. Some machines will be available for a next day service. Please do read the information in the delivery section for the product that you wish to purchase as it will contain all the relevant info for that product. Our customer service is on hand to answer any questions regarding delivery or to book the delivery slot for you. Why should I buy from Sweatband.com? 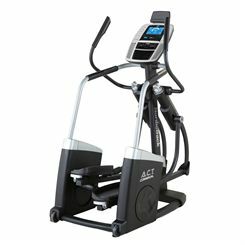 We have been selling fitness machines including ellipticals to satisfied customers for over a decade and we pride ourselves on our customer service. We have a full team here ready to help you at any stage, whether it’s product advice, placing an order, delivery related or in the unlikely and unfortunate event that there’s a problem with your machine. For this we have an experience warranty team who will be your first port of call and won’t leave you on your own to deal with manufacturers, but will be proactive in resolving any issues. We only sell quality products that we believe our customers will enjoy, and have extremely competitive prices. We also have physical stores, with a racket sports focussed shop in Central London and a fitness warehouse in North Manchester. So we’re not just an online only retailer! Head up this page to start browsing the machines right away. You can use the filters to get more specific results, such as by price, brand, stride length and front or rear drive. Don’t forget that if you need further assistance, you can give us a call and we’ll be happy to help.